Here we go again with another fruity/citrus-y bath bomb. I definitely have a type. I hadn’t heard that much about this bath bomb before I purchased it, but I’m sure that’s probably my own fault, looking and reading about the more visually exciting products. It’s one that the sales assistant recommended to me after I told him what I normally like. He knows his stuff, showed me this and I immediately fell in love with the scent. It has sprinklings of lime and orange, with a hint of Fair Trade Cocoa butter alongside fresh bananas to soften and smooth the skin. I have yet to try this one, but my first impression was good and my expectations are high. As I wandered around the shop, I felt like a magpie. The sparkles and the glitters of products caught my eye and I hastily walked over to anything that shined and shimmered. As all the seasonal products were displayed at the front and as a Lush newbie, even I had read the hype around the seasonal Halloween products, therefore I couldn’t wait to see them for myself. The Sparkly pumpkin was the first thing that I couldn’t help but pop into my basket. Not only did it look pretty with the golden glitter, but the scent was gorgeous. I always prefer the fruity scents to anything else and I could smell the citrus coming through straight away. As you can imagine, the Sparkly Pumpkin left a trail of bubbles and glitter as it turned the water bright orange. I think this is my favourite bubble bar to date and there’ s no doubt in my mind that I need to stock up, and quickly! The Christmas Penguin is a blogger favourite and one that I have heard so much about. I always knew I was going to get this little guy, even before hitting the shop. Apart from mine looking quite creepy and looking more of a Halloween product than a Christmas product with that messed up face, it's still kind of cute. With a mix of Sicilian lemon and mandarin oils, I know I’m in for a treat when I finally have chance to use him. I love the staff in Lush. They’re always incredibly helpful and knowledgeable when it comes to products. Telling one of the shop assistant I was looking for glitter, anything with glitter, he led me straight over to this beauty. And yes, he was spot on. Not only was the scent gorgeous, due to the beautiful citrus scents of orange and lime coming through, but when you pop this in your bath, you are in for a sweet surprise. There’s layers of colours in this and quickly, they all pour out and turn the bath a pretty turquoise colour with shimmering golden glitter. This is one of my favourite bath bombs to date and one I need to stock up on! Stay tuned, there's an exciting Lush giveaway coming your way very soon! 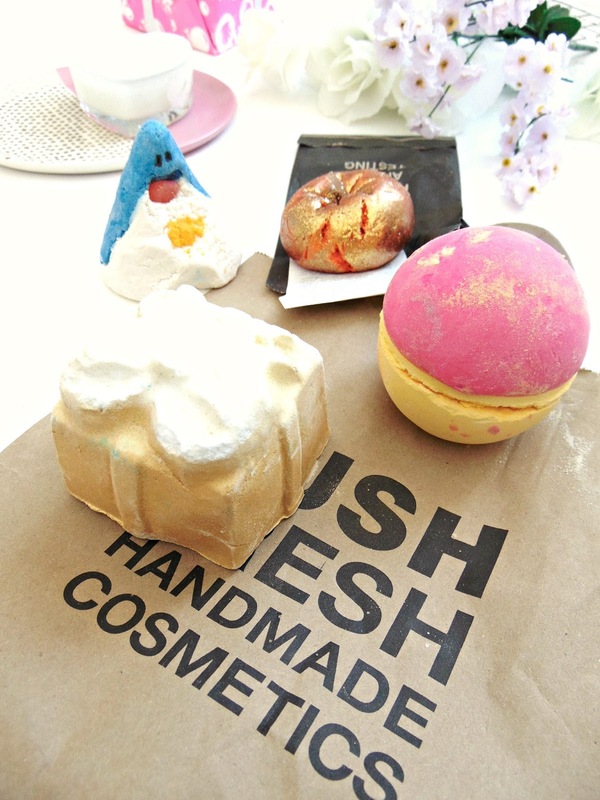 What is your favourite item from Lush? Have you tried any of these?